Here's what we know for sure about Bargman locks: every model has been discontinued and dropped from the Bargman line. Here's the complete list of dead Bargman models (in the order they have been dropped through the decades): H20-2, L-77, L-400, L-66, L-100, L-200, L-300. At this time there are no after market replacements being manufactured and no OEM parts available. Best bet is watching for them on Ebay, where prices are sky high (supply and demand). Vintage Trailer Supply in Vermont may have used versions from time to time, as may Vintage Campers in Peru, Indiana. Vintage Campers also sells retrofit lock kits that will fit the openings. 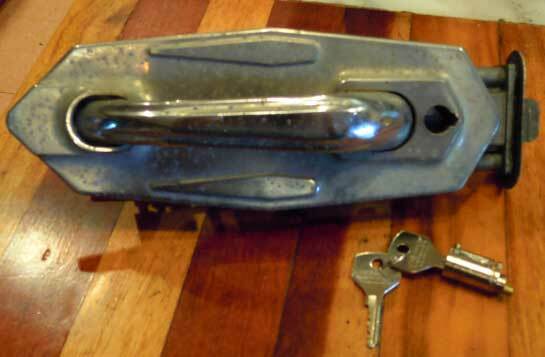 Most of the vintage Scottys have a Bargman L-66 locks. They stopped producing these locks and it is very difficult to find a replacement. Some have discovered them in RV stores but those, "new" ones are running in the $300 range when sold on Ebay. If your problem is a missing key, it is easy to replace the cylinder with one purchased at Vintage Trailer Supply. The new cylinders match the originals perfectly and come with 2 keys. You may be able to ask for matching keys if you order more than one cylinder as there are not that many different keys. One note to mention, in the video, Don is seen trying to tap the old cylinder out from the front. It must be tapped out from the back.